Little fat, little sugar, lots of vitamins and mineral, Vietnamese food is very suitable to improve your immune system, suitable for diet and supply energy. With a lot of antioxidants, drive away aging, salad of mixed vegetables and soups in Vietnam full of vitamin E and A thanks to materials made from fresh fruits. Vitamin E is against skin and hair aging, while vitamin A is necessary to restore external damage, heal scar and help to flatten wrinkles. A standard meal in Vietnam is a source of nutrition more than 10 different vitamins and different minerals including vitamin C, B3, B6, magnesium, zinc, etc. They all contribute to reduce body fatigue. A disk of Vietnam papaya salad contains more than 50% of necessary vitamin C for your body in a day as well as other vitamins like B1, B6, B3, biotin, zinc, magnesium and potassium. Only 200calo and less than 2g fat per dish, it is reason why you should eat it the dish more. 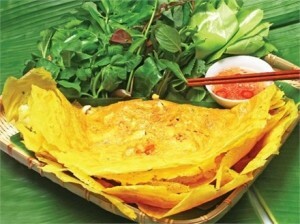 Vietnam’s cuisine does not use much flour. Refined products make you digest quickly, rise sugar in blood, eat more and easy to be hungry. Vietnam food use small amount of sugar, a number of dish use rice noodles, rice paper wrapper and rice powder instead of using flour. Only a small amount of Vietnam dishes are doing this bean sauce, but still nothing so significant. With herbs’ function of curing diseases such as: chervil and mint; Vietnam food is served with various herbs that are very good for health. A bowl of Vietnamese noodle soup is served with many herbs and vegetable that both strengthen the flavor and bring back certain benefit for dinners. Especially, chervil and fresh mint promote liver’s activity and repel indigestion, nausea and headaches. On early this year, health experts have warned us that absorbing too much sugar is as harmful as alcohol and tobacco. 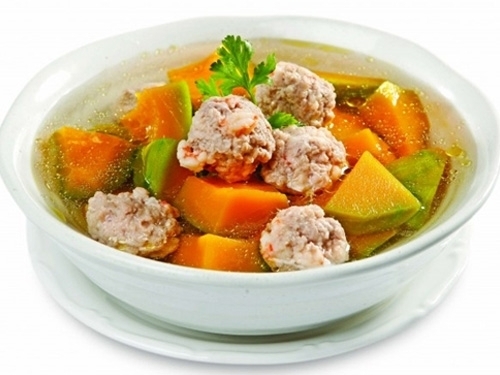 Many Vietnam soups and main dishes have small amount of sugar (less than 5g per course) so you will definitely reduce daily sugar consumption. 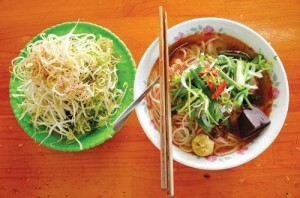 Vietnamese dishes usually include materials from vegetables, fruits and spices, less oil ingredients. Eating Vietnam food help you cut calories and fat daily entering your body. 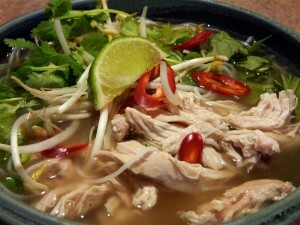 A bowl of Vietnamese noodle soup contains 300 to 600 calories but less than 3g of fat, it means that you can eat for lunch or dinner everyday but still keeps enough calorie intake and not worry about obesity.